Designed for irrigation injection, Duplex™ combines penetrants with a buffering agent that neutralizes hard water ions. Duplex improves the infiltration of rainfall or irrigation through thatch, moving water, plant protectants or nutrients into the soil solution. 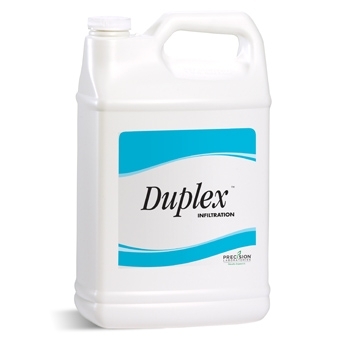 Injection: Apply 20 ounces (591 ml) of DUPLEX into water volume sufficient to treat one acre (.40 ha) of turfgrass. Spray Application: Apply 20 ounces (591 ml) of DUPLEX in a minimum of 60 gallons (227 L) of water to treat one acre (.40 ha) of turfgrass.